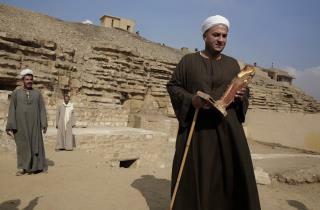 (Newser) – A top Egyptian antiquities official says local archaeologists have discovered seven Pharaonic Age tombs near the capital Cairo containing dozens of cat mummies along with wooden statues depicting other animals and birds, the AP reports. Mostafa Waziri told reporters Saturday that the discovery at Saqqara also includes mummies of scarabs, the first ever to be found in the area. Of the statues found, those depicting cats were the majority, reflecting the reverence ancient Egyptians showed the felines, whose God Bastet was worshipped. Other statues depicted a lion, a cow, and a falcon. Egypt has been whipping up publicity for its new historical discoveries in the hopes of reviving a devastated tourism sector still recovering from the turmoil following a 2011 uprising that toppled longtime autocrat Hosni Mubarak. Lived as a GOD KING... In death.. Are mere attractions for the masses. How long do we have to wait before we can dig up Arlington for "artifacts"? Awesome find. How did they go from worshiping cats to where they are now? Definitely a backward slide.